Cover artwork by Rachel Kinnard. Drawing on a wide array of media sources, including women’s and fashion magazines, trade journals, catalogs and style guides, and employing Michel Foucault’s archaeological method, the dissertation examines the productive nature of fashion discourse in the construction and constitution of the fleshy body, or how the discourses of stoutwear brought order to the disorderly, fat, female body. While previous studies of the relationship between dress and the body have theorized how the body is fashioned, this dissertation builds upon these works through its focus on how discourse manifests fashion practices and thereby gives shape to the cultural body. The first chapter provides an overview of this premise, reviews the small body of extant literature on plus-size fashion and defines key terms used in the dissertation. As an extension of the introduction, the second chapter outlines key methodological and theoretical concerns, including the practice of studying a history of fashion “without fashion,” discourse analysis, visual analysis, technologies of the body, fashion media discourse and dress as a situated bodily practice. The ensuing analytical chapters are organized so that they proceed from “macro” practices (i.e. the construction and constitution of the industry, stoutwear design and advertising strategies) to the “micro” (i.e. embodied dress practices) so as to evidence how the discourses of stoutwear touched every level of fashion practice. Chapter three provides a broad historical foundation for the study by examining the origins of the stoutwear industry and identifying the key actors and firms who were instrumental in consecrating the idea of a stoutwear industry separate from, but adjacent to, the burgeoning ready-to-wear industry. Thereafter, chapter four explores the design discourses of stoutwear and how these intersected with the aesthetics of modernism and the nascent technology of standardized sizing. Chapter five examines the practice of selling stoutwear, and specifically how stoutwear was advertised within the women’s and fashion press and how it was sold within department stores. Key issues in this chapter include the representational conventions of depicting fat women in the fashion media and the segregation of stoutwear into separate departments. Chapter six considers what it meant to look stout and how the stigma of stoutness was constructed within mainstream fashion media and ancillary to the slender ideal. Finally, chapter seven looks closely at style guides as a site of self-fashioning discourses. 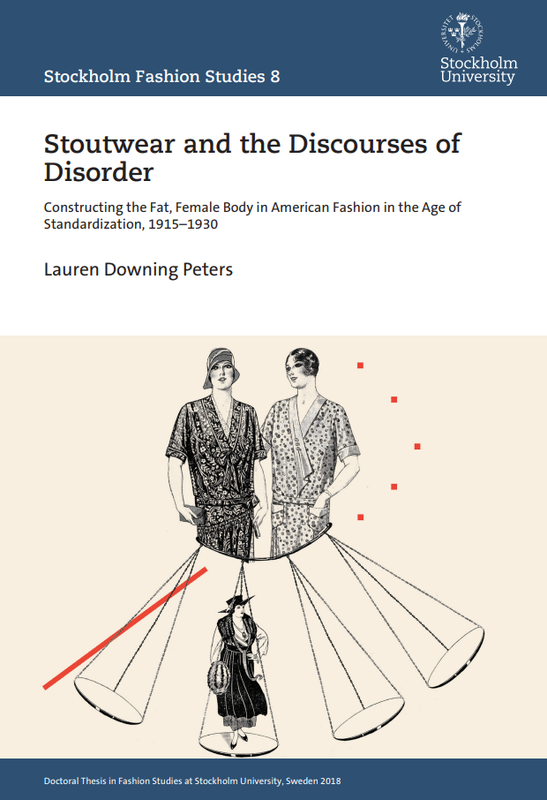 The dissertation concludes that stoutwear discourses were underpinned by a “slenderness imperative,” or a disciplinary regime that manifested a “stout ideal,” or a stout body that visibly aspired toward slenderness. In its entirety, this interdisciplinary dissertation illuminates a history that has been almost entirely neglected within conventional histories of fashion at large, and within American fashion specifically, while also contributing to the theoretical literature on the relationship between fashion, dress and the body. The dissertation has been made freely available to download by the Stockholm University Library via the Centre for Fashion Studies and may be read in its entirety here. Professor Christopher Breward, Edinburgh College of Art (Edinburgh, Scotland) and Director of Collection and Research, National Galleries Scotland.